In addition to modeling the deaths of massive stars, the ORNL Theoretical Astrophysics group does research on thermonuclear (or Type Ia) supernovae as well. Type Ia supernova are thought to occur in white dwarf stars -- compact stars like the one that will mark the end of our own Sun -- that somehow gain enough mass so that a thermonuclear runaway is born deep in their cores. 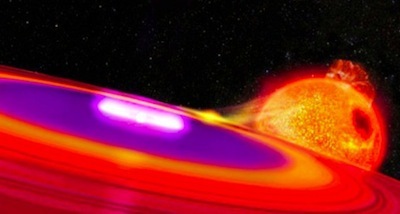 We are especially interested in how this thermonuclear runaway -- that ultimately rips apart the star -- behaves as it reaches the outer edge of the white dwarf. Specifically, how does its speed and strength vary with density in the white dwarf and what observational signatures (e.g., in the amount and kind of elements formed in the explosion) result from these details. Observations of Type Ia SNe have also led to an empirical relation between the peak brightness of these events and their decay time (Phillips 1993), providing a way to calibrate their intrinsic brightness and, therefore, their distance. Because Type Ia SNe are among the brightest objects in the sky, and can be seen from distances covering a significant fraction of the observable Universe. These "standardizable candles" have been used to measure the expansion history of the Universe by several groups (Riess et al. 1998, Schmidt et al. 1998), and these measurements have been described as the so-called "smoking gun" for the existence of dark energy, the omnipresent field that serves to accelerate the expansion. This discovery was awarded the Nobel Prize in Physics in 2011. 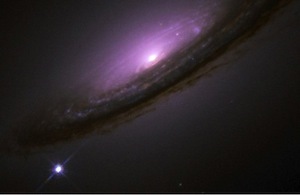 Type Ia supernovae are bright stellar explosions that are characterized by spectral features of silicon indicative of strongly outflowing material (P Cygni features) and by a lack of hydrogen in the spectra. They are among the brightest explosions in the Universe, and can rival the brightness of their host galaxy for weeks after explosion. Although recent observational evidence suggests that a variety of progenitor systems might give rise to these events, in most all cases the central physical event is a thermonuclear runaway disrupting a near-Chandrasekhar-mass carbon-oxygen white dwarf (WD) star. The WD is brought close to the Chandrasekhar mass limit via accretion of material from a main sequence companion in a binary (the so-called 'single-degenerate' scenario) or by merging with another WD ('double-degenerate'). Whatever the proximate cause of thermonuclear runaway, the peak brightness of Type Ia SNe is determined by the radioactive decay of 56Ni, produced by the incineration of the carbon-oxygen star, to 56Co and then to 56Fe. Though the peak brightness of the event is directly related to the amount of 56Ni produced in the explosion, the spectroscopic signature of Type Ia SNe is rich with intermediate-mass elements (i.e., elements between C/O and Ni). This processing of intermediate-mass elements into iron-group elements serves as a driver of galactic chemical evolution, as these events are responsible for approximately half of iron-group element production in the galaxy. Importantly, though the lowest energy events could be due to a pure deflagration model, the presence of these intermediate-mass species alongside the significant amount of iron-group elements observed has long been recognized as evidence for a deflagration-to-detonation transition (i.e. a transition from subsonic to supersonic burning) (DDT). Though DDT is a commonly encountered phenomenon in terrestrial combustion, the usual explanation for this laboratory finding is problematic in the astrophysical setting of a WD. In particular, DDT is often observed in closed channels (e.g. piston chambers), wherein pressure waves emanating from the deflagration front reflect off the chamber walls, eventually constructively interfering and steepening into a shock front that drives the subsequent detonation. White dwarfs lack the closed geometry for this explanation to obtain, and other explanations -- ranging from converging flows on the WD surface (Jordan et al. 2008, Plewa et al. 2004) to reactive gradient steepening (Khokhlov et al. 2007) -- have been invoked instead. Ultimately, however, this question remains one of the primary open issues in the study of Type Ia SNe. 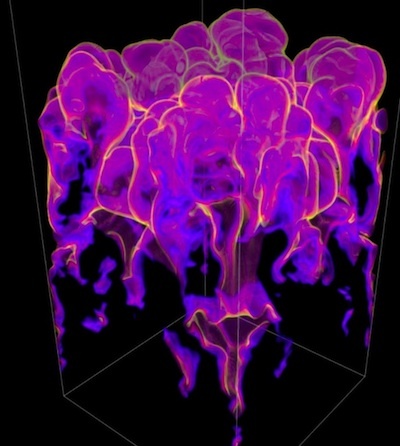 A major impediment to understanding the Type Ia supernova mechanism is that no simulation published to date has used a realistic thermonuclear network coupled to multi-dimensional hydrodynamics to model the explosion. The best networks employed in large-scale simulations have used alpha networks with roughly 13-17 isotopes, whereas realistic simulations require networks with hundreds of isotopes. Indeed, most full-star simulations have simply replaced the entire network with a parameterization (see Calder et al. 2007). This approximation is warranted at high densities (i.e., at 108 g/cm3 and above), where the thermonuclear flame is well described as a flamelet. 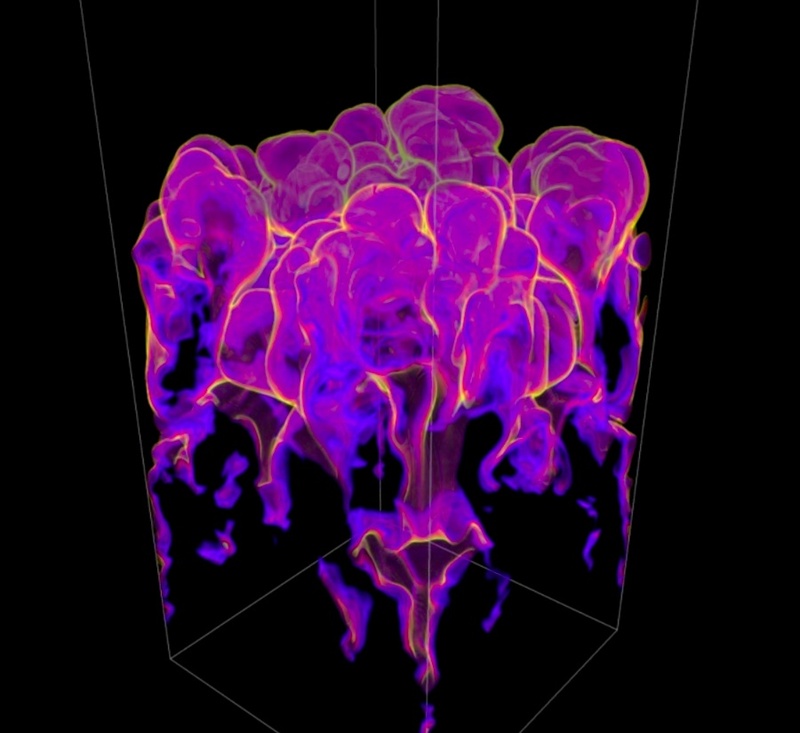 In the flamelet regime of turbulent combustion, turbulent eddies do not enter the flame structure and only contort the flame on scales larger than the laminar flame width. 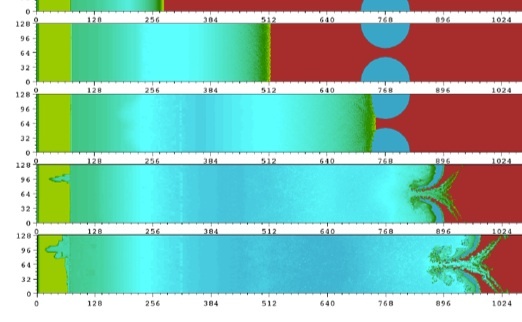 Accordingly, the flame tracking methods used in these simulations become unusable at the lower densities found in the outer precincts of the white dwarf, as the flame width at these lower densities becomes larger than the typical size of turbulent eddies. All current practitioners generally recognize this important limitation, but the common remedy is drastic: namely, nuclear energy generation, whether via a schematic parameterization or small network, is simply turned off at low (i.e. less than roughly 1x107 g/cm3) density (cf. Jordan et al. 2008, Roepke et al 2007). This is especially problematic given that the DDT believed to be required to match abundance tomography observations likely occurs at just these densities. We are performing detonation simulations at low WD densities that we will use for baseline metrics against which subsequent simulations can be measured. We perform these simulations using a version of the FLASH code (developed at the NNSA/ASC FLASH Center). Our purpose is to benchmark both our understanding of detonations in C/O matter at these densities and to benchmark the performance of current nuclear reaction network methods in FLASH. By performing a suite of simulations incorporating an alpha network at several levels of maximum mesh refinement, we will be able to quantify the effects of resolution and network size on future results. We perform simulations in one, two, and three spatial dimensions to fully explore the impact of dimensionality on the evolution of the detonations, thereby clearly delineating the role of the nuclear kinetics.